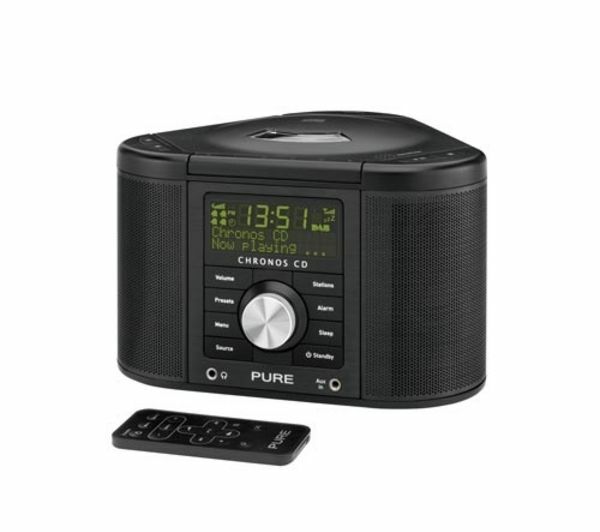 Product details - You can now wake up to your favourite cd or the crystal clear sounds of dab or fm radio, thanks to the pure chronos cd series ii dab fm radio with cd player. Clear and cleveroozing with some attractive features, the chronos series ii dab radio boasts two 2.5 inch round 5 watt speakers and a digital amplifier, which produces outstanding volume and clearness. Play back your favourite albums using the built in cd player.what's more is this nifty piece of equipment allows you to charge compatible devices via its dedicated powerport. Its large digital display also adjusts its brightness automatically to the lighting situation.if you'd prefer, you can awaken to the sound of an original tone alarm, plus you have the option of four independent alarm settings, including wake up time for every day, work days, the weekend and special one offs.the pure chronos cd series ii dab radio with cd player offers a selection of top of the range features, as well as a stunning design that will look great on any bedside table!